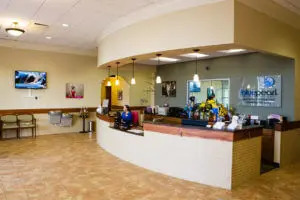 Our 24 hour pet hospital is located in Franklin and serves central Tennessee, including Antioch, Brentwood, Columbia, Dixon, Eagleville, Gallatin, Goodlettsville, Hendersonville, Murfreesboro, Nashville, Pegram, Smyrna, Springfield and Spring Hill. Our BluePearl animal hospital, in historic Franklin, offers 24 hour emergency pet medical care in a region where few clinics do. We also continue to add veterinary specialists to provide expert care in a variety of disciplines. All of these services happen in our 11,500 square-foot hospital that was built in 2015. 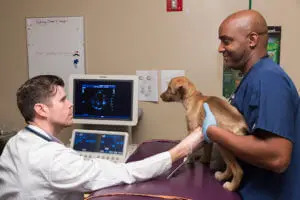 It’s equipped with state-of-the-art diagnostic equipment, like our CT scanner, and highly trained veterinarians who offer minimally invasive procedures. We also have a dialysis and a radioiodine I-131 treatment room for cats with hyperthyroidism.